In a month starts a new salmon season on the Chavanga river. 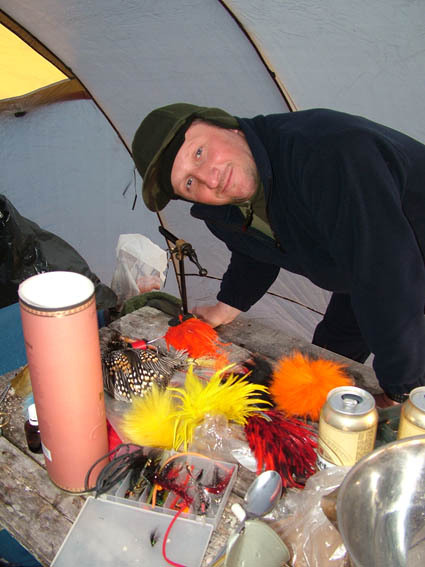 Therefore it is possible to talk about suitable tackles, flies and about fishing methods. This set can be considered from the point of view of personal preferences. 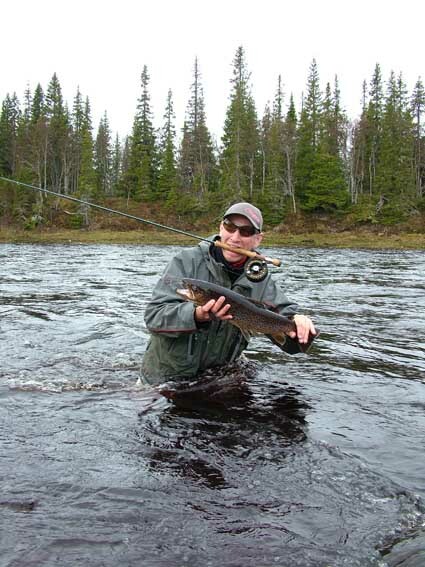 As well as among spinn anglers , there are fly fishermen who aspire to catch the most delicate tackles. And there are those who moves in an opposite direction, choosing more powerful tackles. The second direction in a choice of tackles is defined by their practical efficiency in concrete conditions. The season beginning, as a rule is characterised by the raised water level. The first days of June, it is frequent to the middle of month a water level exceeds average on 30-50 cm. The Chavanga river see at this time bears in 3-5 times more waters, than in the middle of summer. 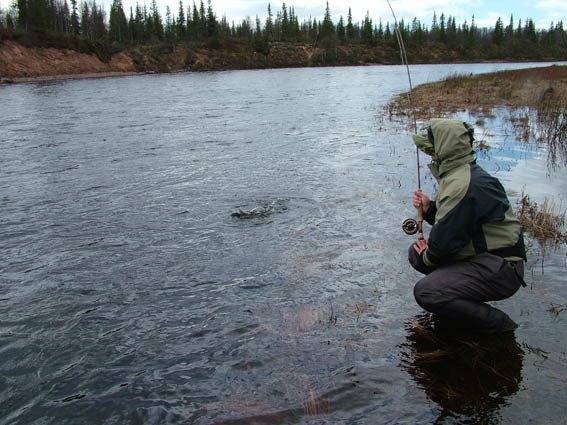 It limits wading ability on water and forces us to use longer and powerful tackles or distant casts. Considering that week is too small term to give it only on training, it is possible to dispose of it more correctly. Fishing tackles to which you have got used and own in perfection. Probably, it is the most correct approach to a choice of tackles for fishing on the river. 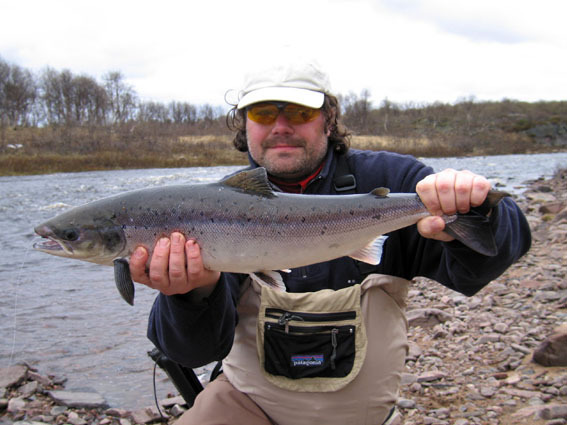 Now it is necessary to learn to understand the river, to find the best places accessible to catching at present. Here the help of our guide is necessary for this purpose. This moment will define the further result. After all the localised fish can be caught in many ways. 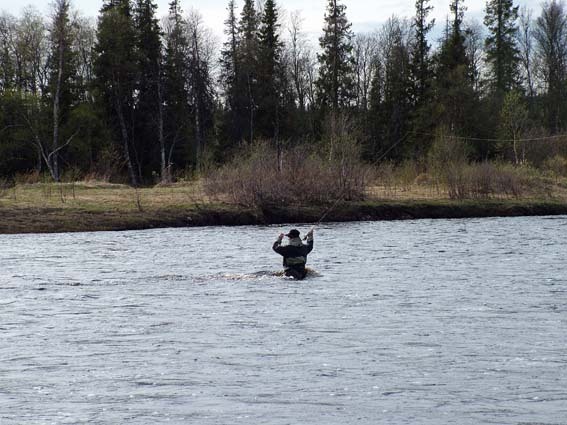 The way of catching is most extended to provocative salmon flies. Here at all has no difference, on what carrier the fly is connected. Efficiency of presentation depends on our possibility correctly to pick up a complex tackle \ method - a line, an leader, a fly with cast techniques and fly presentations. In huge degree the success depends on possibility of replacement of this complex, replacement of components. 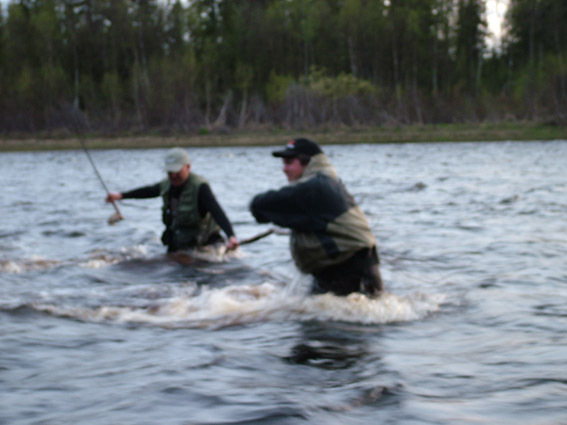 In practice of fishing of a salmon this mobility is limited to flies change more often. But efficiency of catching depends on all complex, from its conformity to character of concrete fish. Salmons are different, different at a choice of places of parking, on temperament, on age. 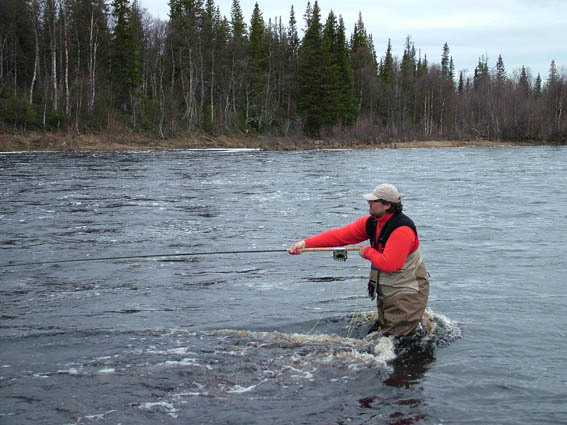 Therefore techniques change (methods of catching and flies corresponding to them) gives the chance to catch not only over aggressive at present fishes. Tackles of middle class of weight are represented by the most mobile and perspective. The river even in the season beginning seldom exceeds the reasonable sizes. Here I will result good, in my opinion, complete sets of tackles, techniques and flies on the season beginning. - single hand fishing-rods 8 classes, 9 - 10 foots of length. - lines WF or shooting heads with the sinking ends, intermediate type too. - flies on any carriers, the size 4-8, ranging from simple single, double or treble hooks, short or long in the shank, barbed or barbless; snakes and needle flies; cone heads, bottle tubes and turbo discs. 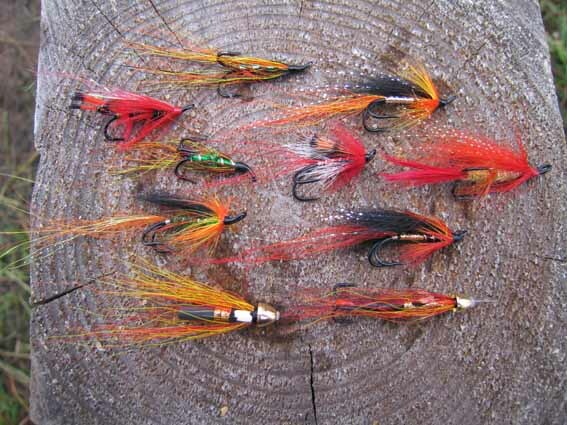 For example - Ally’s Shrimph, Cascades, Willie Gunn, Red Francis and many other flies in red-orange colours with silver both gold and black details. Cast - Standard cast down and across on a current. Mending is added, more often upstream. The most characteristic part of conducting - fly deduction on the straightened line directly dawnstream. 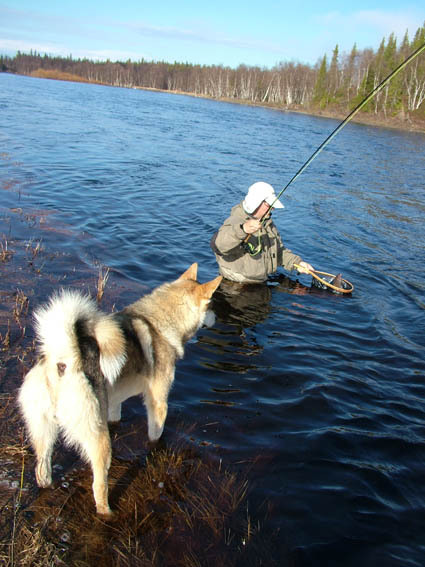 It is the most usual, habitual method of fishing in high water. 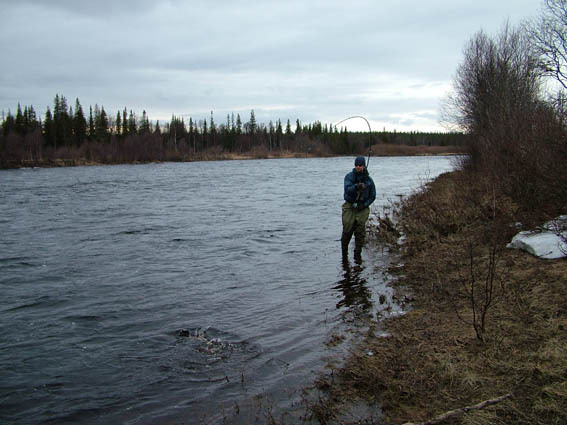 It is necessary to remember only that depending on conditions on the river, depending on the chosen place of catching, other methods can be more effective and interesting. 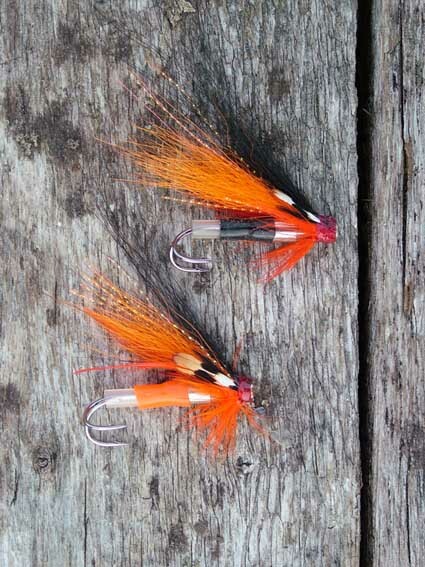 Many streamer techniques, variants on the wet fly, many methods of nymph will be effective for a salmon. All business in a correct choice of a complex tackle \technician for the given place of catching on the river. Our guide Jeorge in action. Early June, hight water lever in 2010 spring.